Yesterday the Yankees and Mets each had a starter return to their respective rotations. Masahiro Tanaka, the ace of the Yankees staff, made his much-anticipated return to the mound. While Dillon Gee, who has become more commonly known as the odd man out, returned to the Mets. Much has been made of Tanaka’s health since a small tear of his UCL in his right elbow was discovered last season. Rather than undergoing Tommy John Surgery, Tanaka chose rest and rehab. While some rolled their eyes at his decision, he was able to return to form late in 2014. However, it took less than a month into the 2015 season for another setback to occur. Although the two aren’t believed to be related issues, Tanaka spent the past month on the DL with a right elbow strain. Leaving many to wonder whether or not Tanaka made the right decision to forego surgery and was putting off the inevitable. In the four starts Tanaka made before hitting the DL he did not look like the Cy Young candidate from last season. His fastball was sitting in the high 80’s as he was clearly holding himself back on the mound. I’m not sure what exactly happened in the month since his last start, but Tanaka seemed to have returned to form yesterday. His fastball was clocked as high as 96 MPH along the way to dominating the Seattle Mariners. With the AL East up for grabs, if Tanaka can stay healthy, and that’s a big if, the Yankees 1-2 punch with Michael Pineda and himself anchoring the rotation could make the Yankees the team to be within the division. Reluctantly awarded a spot in the rotation when Zack Wheeler underwent Tommy John Surgery in spring training. Then forced into a battle, for that same spot, with emerging young arms Rafael Montero, Steven Matz and Noah Syndergaard for most of March. After suffering an injury that landed him on the 15-day DL, he was then replaced by Syndergaard in the rotation. Syndergaard seized his opportunity and excelled in his first few starts, causing the Mets front office to overly extend Gee’s minor league rehab assignment to buy Syndergaard more time at the major league level. Gee was recalled as part of the Mets plan for implementing a six man rotation, that will last for the foreseeable future, in an effort to limit the workload on the young arms. There is a buzz that has surrounded most of this Mets rotation throughout the season. When Matt Harvey takes the mound, it’s an event in NYC. Jacob DeGrom, the reigning NL Rookie of the Year, is as cool as they come and he’s picked up right where he left off. Syndergaard, who has lived up to his “Thor”nickname, strikes fear into batters with his 6’6” 240 lb presence on the hill to go along with his fastball that flirts with 100 MPH at times. Even Bartolo Colon, who leads the staff in wins, has become must watch TV for the pure entertainment value (especially at the plate) he provides. Then there’s Gee. When he’s listed as the probable starter, the game really has no feel to it. He gives fans a kind of “blah” feeling when he takes the mound. Sure he will keep the Mets in the game, for the most part, but he doesn’t provide any extra excitement that entices you to tune in. Yesterday didn’t help his cause in arguing against that point. He struggled in his return to get through his four innings of work. “It wasn’t as bad as it looked” said manager Terry Collins. I’m not sure which game you were watching, Terry, but yes, yes it was. With Steven Matz patiently awaiting a phone call, Gee is on a short leash to turn things around if he wants to hold onto his spot in the rotation. 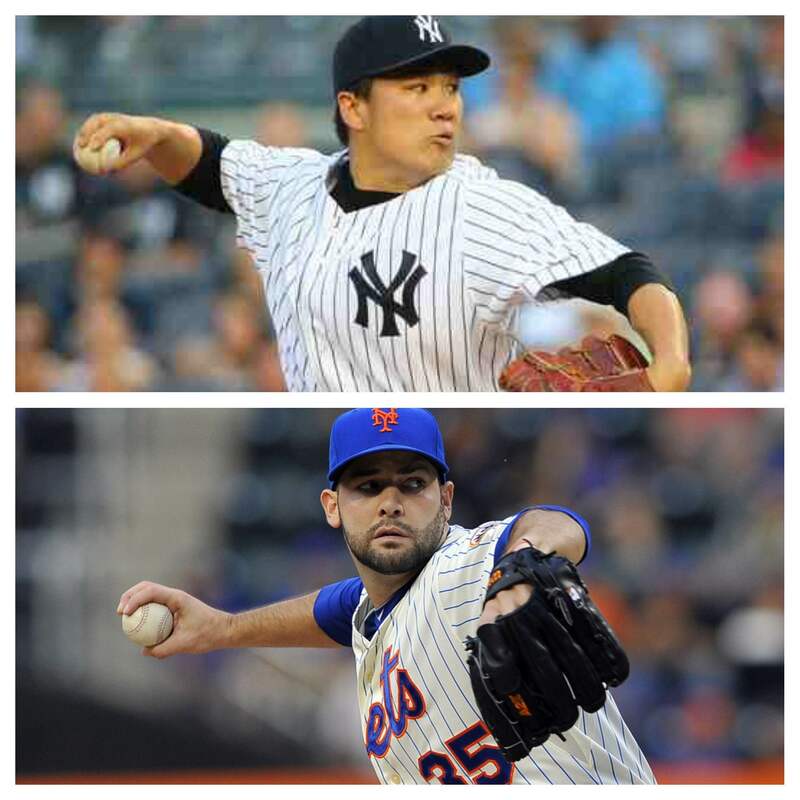 At the end of the day, it was only the first start back for Tanaka and Gee. But each fan base was left with completely different emotions by their end results. Yankee fans were given hope that maybe they can put a strangle hold on the AL East, with no team differentiating themselves so far, if Tanaka can stay healthy and returns to form. While Mets fans were left scratching their heads as to why Gee is still hanging around.